Empress is a popular type of Porcelain system used by dentists. Porcelain is used by dental technicians to create lifelike crowns and bridges for the dentist. The dentist will usually specify a shade of porcelain, corresponding to a set of pots in the lab containing the porcelain powder. A common shade system used is the Vita guide. The powder corresponding to the dentine base is mixed with water, and then fired. Further layers are built up to mimic the natural translucency of the enamel of the tooth. Sometimes the porcelain is fused to a semi-precious metal or precious metal such as gold, for extra strength. Newer systems use an alumino-silicate core that gives increased strength. Aesthetics and durability are important considerations for all-ceramics. IPS Empress has proven itself for more than 15 years as regards both criteria. 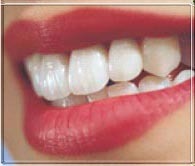 The IPS Empress pressed ceramic system satisfies discerning users and patients all over the world. Twenty-five million placed restorations are testimony to the durable true-to-nature effect, long-lasting success and the high quality standard of IPS Empress. The Original System is continuously being developed, setting trends in the market with regard to aesthetics and function. The most recent innovation from the field of all-ceramics is called IPS Empress Esthetic. The material opens up a host of unexpected possibilities for inlays, partial crowns, full crowns, and particularly for veneers. The proven IPS Empress 2 pressed ceramic is a lithium disilicate glass-ceramic suitable for the fabrication of bridges for the anterior and premolar region due to its increased strength. NEWS from the IPS Empress Original System for the dental office With the new IPS Empress Esthetic Line for inlays, partial crowns, full crowns and veneers, the product family has been selectively further developed. The result is an extremely homogeneous leucite glass-ceramic, which features natural light scattering and offers a balanced chameleon effect. Due to an increased density and homogeneity of the crystals, the restorations blend beautifully into the natural surroundings. Moreover, the flexural strength of the ingots has been improved from 138 ± 12 MPa to 160 ± 8 MPa. Objects modelled in the lost-wax technique feature a particularly high accuracy of fit, as there is no sinter shrinkage. IPS Empress Esthetic consists of the IPS Empress Esthetic Ingots, the coordinated Speed Investment Material and the ready-mixed IPS Empress Esthetic Veneer Layering Materials. The ingots are available in the popular staining technique shades as well as the bright E TC0 and E OC1 shades for the veneer technique. With the layering materials, veneers and anterior crowns with outstanding aesthetic properties and accuracy of fit can be fabricated by applying a combined press/layering technique.